But Isadora did not die, though she took into her dance, her pain and her sorrow from her life. But she was an artist long before that time, and thereafter. Hence good choreography, to future generations of dancers, is more important a legacy, to leave behind , than dancing. Isadora left no films of dancing behind. There is only one short film, pictures, and drawings, and many descriptions of her dancing. Her relatives taught her dances to others and those dancers have formed companies to memorialize her choreography. My teacher once told me, it was less her actual movements and more her essence, her freedom and her liveliness, that we incorporate into modern dance-the acceptance, finally, that the mechanical precision that is ballet, which Isadora was against. The freedom to express oneself, as in acting, and to let that lead us into dancing, to expressing, and to blending with and being part of nature. Isadora also believed that dance was religious, and if it was not, it was merchandise. The art has always held that there are always dancers, but not enough good choreographers, not all of whom have been successful at dancing. Perhaps, then, there is just as much importance that could be placed on the failure to win a competition of dance, in the sense that one is not able to perfectly copy, the variations in question, less likely to become a perfect representation of the idyll of a form of dance than another-and more likely to be original, than could be made in support of it and winning. Her life told of a woman who despite her very best efforts found the need to escape life, even love, to pursue art and to create-to think she would be any different when not making art is not even fathomable to me, as those articles suggest she should have done. If she had lived her life any differently, and her art was more commercial, her actions more conventional, her art would not have been possible. In an age where World War I, was fought, the age of industrialism began, German expressionism found its way up and out of a country torn by these new ideas, into the rest of Europe and in America, where Isadora was considered revolutionary, and artists, musicians, philosophers, and actors of the era flocked to her salons, where her school was welcomed and survived, Isadora brought the form of dance into the 21st century-she revolutionized it. Those great minds were not sure that dance was important enough to hold a position among the important arts-Isadora convinced them that hers was the body electric. Artist, yes, politician, no, but in her dance, as in their writings, and art and music, they expressed their collective desire for change, Isadora represented those changes in freedom of form, dress, and action, especially for women, whom men would have left on their pedestal, to remain for generations to come. Isadora did not just bring dance into the revolution, she brought herself, willing to give her life, to be part of and to support that change and those freedoms for other women. She made the ultimate sacrifice for this freedom-her children. God gave his son and Isadora gave her only two children, whom she loved. I am sure Isadora said a lot of things, but I have tried to find anything she said outside of her book, unsuccessfully. It is if by divine right, and wrong, I know what she would have approved of, and what she would not. She did not approve of marriage, and the notion that women were chattel. She could not have stayed isolated in the home, where women were bound, to rear children, to cook, sew and clean. She would not have felt sympathy for women who took that vestige upon themselves and then complained about it later. She not only felt equal to men, she knew that men responded to her dancing, that language, and that if communication were impossible with a man on one level, it was wholly possible on another. Her words and beliefs are little known to us, but in a time without technological advances, she was drawn, studied, watched, written about, and copied more than any other dancer in history-to this day! She was the first really modern women. She was like Athena, Aphrodite and Hera, and all the greek and Roman goddesses rolled into one. She chose to emulate the chaste superiority of classical figures, instead of the weak, wishy-washy women of more current history. She went back in history to find her sources of strength and encouragement, when women were figureheads on their own and not at the side of a man, and yet in living her life, she found this a very difficult philosophy to put into place. While she could segregate this in her art, she was not able to put it into practice entirely in her love-life, where she always found pain, abandonment, and people who fell short of her expectations. So she turned to her religion, her dance, and there she found fortitude. These are not lesser ideals, but rather greater ones, she practiced what she preached, completely. Her ideas and actions caught fire and blew in the wind to the four corners of the earth and modern dance and the modern woman was built-just like that, by observation, and carried on by other artists who continued on in her image. Most composers of the time did not like to do ballets at all because they did not consider them art, rather music for stories for the masses and political, commercial-ballet was a popular art form at the time, compared to ET, Star Wars, and the circus, art for the masses, and almost all of the dances that young classical dancers dance have to do even now, deal with death, unrequited love and sometimes victimization of women. Dancers today do not always understand these dances, that are history, exhibit socio-political levels, such as serfdom and aristocracy, and the showcasing of the talents of the poor, not being able to rise up to be the queen, but to die instead, where the love of her rapture is eternal. These are not ideals I want my daughter to copy, even though they are beautiful-they are old, misunderstood and not appreciated. Shakespeare and opera are the same, but it is as if we are trying to carry on these traditions without understanding them. Even then, Isadora knew they did not express her angst, her feelings or her hopes for the future. She knew that what lay ahead would emanate from herself, her soul, and not the soul of some old composer or choreographer. She danced to new music, the music of other minds, not commercial music. If not for the supporters of that music, much of it would have been lost as well. Many of the great ballets are political, and express viewpoints that today are not in the mainstream and we spend all these decades, imbuing our daughters with the right to vote, be educated, run corporations, the world, only to send them back centuries to be courtesan dancers and flexible women-what power do women have in dance, if after one century, the foremost achiever in that field, for women, is to be denounced on the basis of a statement she made concerning the appropriateness of training for exclusively one purpose? YAGP is not about great art, great artists, or great dancers, it’s about money and separating parents from it, and well, whatever positive things might happen for themselves, their friends and consequentially, ballet. Isadora’s was a businesswoman, too-one of America’s first prominent ones. She was not trying to sell old culture, she was trying to sell something completely different-the freedom of women and dancers, and she proved that it could be done. When I was in high school, and could afford to pay for dance classes, I wen to the local ballet studio, and asked about beginning dance classes. The receptionist asked if I had any previous dance training. I said, I had danced since I was young, but I did not have any ballet training. She said I needed to go to the community college and take some ballet, or get some from somewhere, before I could take there. She said they had only one adult ballet class and it met on Friday evening, and in order to do well in that class, I would need basic ballet principles. I was very disappointed, but not for long. I went to the community college and registered as a special high school student in order to take their dance classes. They offered ballet (Patricia Burke) and modern (Patricia Fox). I registered for both, after having talked to the head of the department (Patricia Fox) and explaining my problem. She said that I would show improvement with 4 classes per week. Each class met 2x each week. At first, it was very, very difficult. There was class, warm-ups, etiquette, clothing, center/barre, center/adagio, floor/allegro, winding down, actual dancing, music, history, and pain. But, after the end of the summer semester, I went back to the dance company school and registered for the Friday evening class, as well as the Fall semester at the college. I had friends, who were pregnant, dead, in jail-or on their way, drinking and doing drugs, raped, fighting, and finding other myriad ways of venting their rebellious and youthful, feelings. In modern dance, and ballet, I found two different role models in myself, one natural and self-loving, strong and free, the other obedient and disciplined, beautiful and resilient. Each parent was in myself and within the principles of each discipline that was being passed down by these two teachers, and within these different, but similar structures was a sort of yin and yang of the body and the mind. My spirit grew and was strengthened, helping me to avoid the dilemmas that had frustrated me before, and the pitfalls of youth. Dancing helped me to become more disciplined and to believe in myself and what my body and my mind were capable of achieving-who says dancers are not smart? I pointed in one, flexed in the other, was parallel in one and turned out in the other, one was natural, one was formed, but both were to me, an idealistic life of self-expression, strength and beauty, but only one would take me in, accept me, and mold me, allowing me the freedom to dance-modern dance. Or so I thought. Had I applied to and attended the North Carolina School of the Arts, then, I might have become a great ballerina, for in the next two years, I was able to master all of the ballet and modern dance which was put before me, and my ballet teacher was a dancer with the Royal Ballet, and she believed in my ability to do anything. The teacher at the dance company school, Josephine Schwartz, would also come to invite me to other ballet classes, and to encourage me. I remember when she said I had perfect balance and suggested that I enroll in the Summer Intensive the following year. It was that summer that I felt that dance was my alter ego, and I began to express myself through it. I would say that my strength was my strength, and my ability to express myself naturally, some people just do not have or are not interesting to look at. First comes form they say, until they kill the dancer that is within the self, expecting her to find it again, when technique meets expression later on, while modern dance nourishes both the expression in the dancer and the technique of the dancer from the start. But, I was creative in other ways as well, and dance taught me to give credence to those abilities as well. Having achieved on my own what I set out to in dance, I pursued my drawing and painting with the same verve, my causes and support, and acting in theater productions, all at the same time. I found numerous ways in which I could create, express myself and dance was not the limit of my imagination, but rather the imagination extended from it and began. It was the seed. I found that alone, it did not fulfill me completely, I wanted to draw, print, paint, speak, move, act, sing! I did. I even found that the discipline required in dance, the improvement of the self, was like therapy and within that classroom, in my body and mind, other seeds were being sown, voices were riding up in other disciplines, which called to me to investigate them, and I did. Even when I went to New York for college, I carried my portfolio, my Chinese book (Speak Chinese), my clothing and jewelry, my potions and lotions, my dance bag, my books and journals, art supplies, coats and sweaters, socks and boots, and a book of where to dance in NY. Within a few years, I had danced everywhere in NY, ballet and modern, I had stacks of gallery cards, and many Chinese artifacts, many more books, more and different clothing, dancewear and journals. I had many more ideas, drawings, paintings, prints and hopes. I had music manuscripts and was learning to sing opera. I danced in clubs and socialized. I knew the Zuckermans, and had attended many ballets at Lincoln Center, seen many plays and musicals, met many interesting people and worked to support myself, primarily. I went one day for the position of a receptionist at the Merce Cunningham Studio, after submitting my resume, and Merce Cunningham asked me to attend his classes and possibly to dance with him. Merce Cunningham was not at the top of my list, but I realize now that I turned down the position, because I was more moved by creating art than dancing. I was too academic, and I was afraid that committing to dance classes and a life of dancing was not for me. I was a dancer, I had to dance, but I had to draw and paint and communicate in some other, more tangible way, what I felt to be important, and that because I had been given so many gifts, I could choose a more practical way to communicate, more direct. I continued to dance at Martha Graham, where I also met her-she still taught at that time, Eric Hawkins, and many other studios as well as at NYU. But most of my time was taken up by drawing, painting, making art, and my other classes, as well as social relationships with film students, art students, dancers, communications majors and writers. I was very involved in music events in college, dancing, and going out to see these many interesting places and people. I spent every weekend day walking and going to art galleries, and this was the most inspiring thing of all to me. The culture on exhibit, everywhere you go, in a great city, the ability to have, right at your fingertips, the great masters alongside the new. But dance was the seed of all that and more. Youth is a period of physical self-searching and age is a period of indexing and analyzing what you have learned and all that your life has meant. The agony is, becoming lost on that trail or having things not work out as planned. This can be a real setback for some people. Love is for people like us, just as much of an experience, and necessary, for artists, for from their great pain frequently comes great work. But, in the artist’s life, there is not always the understanding desired in love, the soulmate, which is sought. Frequently, there are demands made in a relationship which bring into question the very purpose of one’s existence, and even while I have reared my children with and without mates, I have never found the perfect union, where I was encouraged or supported truly in my work, but have had to take on the cloak of motherhood, sole supporter, and ego booster to a man, who while he was following his own muse, never took the time to really encourage me to do the same. Hence, only while I was alone, even with my child, was I able to take time away from the relationship, or the caring of others, to work on myself. Now I do not dance, I do not draw, I write. Many opportunities have passed me by as a result of age, my beauty is not longer the flag it once was, but I do still have my soul and the freedom to express myself in many ways. I have time ahead of me to do those things which I want to do, and hopefully, my health. Isadora Duncan, was, however, one means by which I found my own path of enlightenment, and I prayed. A lot. But, God pointed me to dance when I was lost. Dance is the way I discovered that I had something to say, that there were ways of learning languages, unlike the common everyday patois, that there were reasons for learning to do things, that there is no gain without pain. Who would think that by the body, a temple unto itself, one could emerge, like an explosion, where after such discipline and self-searching, one could become, almost magically, capable of expressing that same energy and zeal in every aspect of one’s life. A stronger animal, a survivor. Suddenly, I got more meaning out of everything else. I was suddenly able to make the cheerleading squad-I did not stay-but I made it with that one jump. I could suddenly devote myself to drawing for hours, find that place in my mind, in art, to create, close my eyes at a symphony and he ar the music. Feel it. I could dance, up and down the streets, at the bu stop, in the stores, everywhere I could move. Even in my bed I was pointing and stretching, never dormant. I could act, and put myself fully into a role. In fact, acting alone was not enough, theater and politics was a waste of time and boring, so I would move, even as I was instructed to do something else. I could multi-task, as long as one of those tasks was dancing. Business became creative for me as well, much as it did for Isadora, going from door to door, determined that my ideals were worthy and my beliefs were important and groundbreaking, if only someone would listen. It gave me the confidence in myself that I needed, in other areas, maybe more important, to me. I drew with a newfound conviction, and spoke my thoughts even if they were not appealing to everyone in the room, or understood. I was not afraid of failure, I knew that failure was the means to success, to trying and trying again, by dance. I am not sure ballet dancers, alone, understand the need to express their own feelings artistically, and it is certainly discouraged if one is taking only ballet. Ballet has not reached the level of a national pastime, like football, or baseball, and even sports events are not as well attended as they once were. But I do not think people tire of dance, watching bodies in motion always seems to inspire other bodies to motion. Anything that promotes motion I am all for, even ballet, unless by doing so, it naturally and deliberately is a business undertaking disguised as a non-profit, as so many arts-related undertakings are these days. But, when so much emphasis is on the technique, and not the artistry, and self-expression, children get confused and are tricked into thinking that ballet is the only form of dance that is capable of perfection, true beauty and harmony. The message is very clear that if you undertake the study of ballet at a Russian school, you have a better chance of being accepted, for you will be doing things “right.” Parents do too. It is not harmful to learn ballet. But to excel at ballet, one must be of a certain form and ability. Also, one is certainly going to be put to the test of one’s abilities, whether physically possible or not. At least 80 percent of ballet dancers have injuries. Most of these children begin ballet to appear in recitals, learn to dance, have fun with their friends, gain confidence. But in order to dance the great ballets, a dancer has to have a high level of technique-and Russians believe in doing it properly, and so do other methods, but they do not begin serious study before age ten usually because the mind is not mature enough to understand the theory behind it. Many parents train their children in gymnastics or other forms of dance before commencing ballet. This is seen as practical by many teachers, but there are dancers that are harmed in their dancing careers this way, by ruining the muscles needed for strength and endurance in ballet. But I believe it really comes down to those expressly formed for dance and those who are not. However, I do not think that anyone should be discouraged in dance, but rather all should be encouraged, do you never know who will be the dancer and all benefit who try. Nearly all of the dancers at YAGP, including winners, do not fit the true mold of Russian dancers starting out, having not been selected by body type and groomed, the way only Russians, do. And many of the winners of YAGP are trained by Russians or in the Vaganova method, and so YAGP is also about Russian ballet method and not Cecchetti, Bournonville, or Balanchine. Some very good dance studios do not participate in YAGP-in fact most studios do not. I think this is because no matter how many other judges, two of them are always going to be Russian. It is probably too late for many of the dancers eying the competition to get the specific Russian training they would need to win this competition, but it is not too late for them to dance or dance ballet specifically. Russian studios are supported by these people and vice versa. Remember when Balanchine said he could train elephants to dance? Well, they are, but even then, only some dancers do it well enough, or consistently well enough, and improve, to get the attention of the teachers, even for performances or competitions. The other students get left behind, not encouraged in ballet, and pay the fees necessary for the studios to survive. If more studios taught forms of modern dance, then students, who were not gifted in ballet, would move into other kinds of dance, but I do not think ballet studios, in general, have strong modern dance components. One reason is, they do not believe in it. It is not their passion. That is why, I think it necessary to have schools in which all children can have the opportunity to learn the forms of dance and other arts. I think if many of these teachers pooled their resources, they would have very fine dance schools and programs, instead of fighting and disagreeing, offering not one Nutcracker but 50 nutcrackers per season, mainly for the families who attend classes there. Surely, there must be some other fare, and performances they can do. Art seems somewhat lost these days, and there are many really good dancers, but most of them were never in YAGP. These days someone has a cool idea, a quick fix, a batterie of incredible gymnastic feats and they call it “art,” and to me, that is what I see at YAGP. That’s sort of impressing but it is not what Isadora Duncan was calling art. Art is within the self to achieve and come out, in any form, not just dance, but in the physical expression of ideas and feelings. Some dance, some paint, some make mobiles, buildings, create companies, promote causes, or represent other artists. Anything can be creative and everyone (nearly) is, but it is not enough to say, if you have flexibility, that you are an artist. That is what our children should learn so that if they do not feel they are able to express themselves in one language, they do not feel all is lost, but rather that they can achieve anything and dance is a pretty good language to start. This is not stressed in competitions, such as YAGP, but rather technique is eyed closely and one dancer is given a medal for apparently having the traits of a dancer, but who is to say who will become the better dancer? Or that merely the ability to copy someone else’s choreography, to better effect, is worthy of a medal? Especially when those dancers are in class everyday and everyone around them knows their strengths and weaknesses better than the judges. It is silly. There was no bandaid for the pain of having one parent, or having another parent who did not desire to see me, or to know me, while other children had theirs, and siblings, too. I assumed. Sometimes all that was going on in my head made it difficult to concentrate on schoolwork, and though I have learned to channel my feelings somewhat more constructively, they have always been my master. I am impulsive. I was also gullible, and not a coward, maybe dumb. I had no fear of being kicked out of school. I created escapes in my mind, every hour of the day had a different room, a different path to go by, to avoid the school hierarchy, and learning anything they sought to teach me en masse, I figured we all had to be dummies if they were teaching us the same things. There was no opportunity for reward, sincerity or achievement. I only picked up in high school and graduated, because I had finally figured out where I wanted to be was New York, and I had to have the grades, and a plan to get there, but one of the vehicles was dance. But, reading the last article, I suddenly remembered that film. I remember her dancing and her life and much of my own life suddenly made complete sense. I was vindicated for there again was my secret role model. if only I had remembered her before this life happened so long ago.She could be the inspiration for many of us in this day and age, if only we could all see that film. 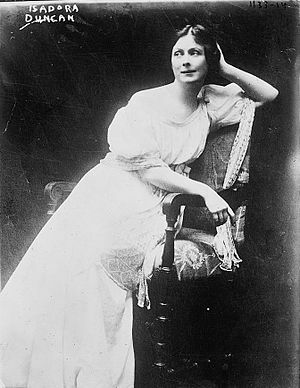 Anyone who does not remember her choreography, imitating nature and the forces of nature, casting off point shoes and the strict regimen of ballet, and setting out to do something different-to express herself-does not have a clear enough picture of Isadora Duncan to revile her publicly. YAGP, above all else, was created by a woman, who saw a need for dancers to receive scholarships and assistance, who would otherwise not be accounted for (probably) in the dance world. Isadora also had her own school, where at least the hand kissing was peremptorily done and over with, whereas at our own schools, this hand kissing is done each and every day, and all through the career of the dance student, in the form of more and more investment in not only classes, but donations and in furthering the ideals of the dance studio and its performances, whether or not your child in particular will succeed. Perhaps I always thought women were more powerful than they actually turned out to be in real life because of my late night heroines. Isadora Duncan was definitely one of them. She said, “I can do this.” And she just did it. In school, I would have been doing pretty much the same thing as Isadora, and I too, found that boring at times. Forced to sit in Ms. Broadbent’s class (why is it that teachers often fit their names? ), doing math, completely lost in fractions, and sneaking off to the bathroom to ruminate on why vitamins make your urine green. I would go to the window overlooking the asphalt playground, seemingly several stories high, and swill in the chilly clear air. The sun shone, and on cloudy days, I always eyed that closed window, and its sheet of gray, remembering its opening to brighter days, perhaps a passage, as in Narnia. Perhaps this is the way Isadora felt. Not only dance, but Isadora’s way way of life also was a means of expressing herself, her grief, her boredom, the pat lifestyle, that for women of those days was imminent and required. She acted like a man to her critics, but we now know she simply did not learn to depend fully on men for her ideas, her actions and her substance. Though an artist of great ability, Van Gogh took his own ear, Cezanne wasted a life recounting the nuance of light and shade of the same scenes and still-lifes, Frida Kahlo expressed turmoil, sadness, loss, and jealousy through her work, not always depicting these things, but consequentially as a vehicle for her feelings. Are all artists to be condemned for their lives being second to their art? Other unquestionably great artists of this period and before (and after) searched for a new way of expressing the angst and beauty of a world changing fast due to industrialization, communication and new thinking. Isadora was just one of many artists, but in the world of dance, she was not the only one either. She was just the most famous one, the most interesting one, and the most stunning. I am certain that if we were able to view more films of her dancing, we would see what the general populace saw and why she hit a note with them, what they found so formidable and inspiring about her performances, would also be able to be seen by us, if not fully understood, and in context of the times. Today, in Russia, fighting of a violent level has occurred concerning the actions and beliefs of one faction in the world of ballet, whether to move forward, create new choreography, open the world of Russian dance to foreigners, or whether to remain the same, with the exacting standards only maintained in Russia and China (perhaps), where ballet is considered such a vital part of its cultural identity that no change or interloper should be allowed to set forth ideals that might threaten the very integrity and sanctity of its history. Change is imminent. The artists of Russia, in the past, who have sought change, have left Russia, and who we have had the privilege to learn from and to appreciate, have been responsible for keeping ballet alive and strong in the United States in part. It is also due to their abilities in this medium, that our own dancers have been seen not to have the same technique. These artists have become great stars here, due to their virtuosity and training. Without them and their great contributions, such as teaching and performing, choreography, and even YAGP, we would not have that level of training available for our children, but it should not become the only training or philosophy of ballet in this country. This would have deprived us of choice, and forced us into a regimen of ballet where only one methodology was unanimously upheld as the best. Great dancers have emerged in this country without strict Russian training. There is a place for everything. There are many great dance companies in the world and they are not only Russian. Even though YAGP has judges from other schools, there is much politicking of the founders of the competition, with Russian schools here in the states, and attendance oat these schools has increased since YAGP, due to students who come there to be taught specifically with hopes of winning. It would not be fair to expect Russian teachers to teach something other than what they were taught and to have anything other than high standards, but other teachers also have high standards, and it is a sad day in America, when those teachers are not being promoted because they do not undertake to win YAGP. The public might be conflicted and kept ignorant of the fact that there are other equally good dance schools, teachers and ideals-in ballet. I understand the strength it takes to have an idea, and carry that idea over into something meaningful. Who knows whether it will be successful or not, whether it demands too much of children and parents, but we have always been a nation of people who were open to new ideas, impulsive as we may seem, many of these ideas, including YAGP, or a film about Isadora Duncan, or modern dancers, would not have been possible without us. Despite the fact that many foreigners criticize us, they hearken to our shores to make a salary, where they feel they will be appreciated and where they may succeed. If they did not feel that we were friendly and open to them, they would not come. The American people have accomplished and supported great things, and it would fall to us whether to be supportive of YAGP and to what extent we will believe the diatribe of the classical dance competition. I do not think these people expected to form relationships, to have students whom they felt were spoiled and lazy, and ones that were determined and poor. Just like in Russia. I do not think the violence in Russia stemmed from a group of people who expelled change, but rather with one person who expressed retribution violently, like any insane person might be expected to do. I do not think we can judge anything at all by that. I did not understand life when I first saw the film about Isadora, danced a few steps in the living room, with no one watching, seeking to meld with her free spirit, and taking steps of my own. But I did learn something. To dance. I remember her flowing hair, bare feet and gossamer gowns, styled after the ancient Greeks, music-she believed in the natural body, being able to move freely, unfettered by corsets, whalebone and suffering for art. Her short and violent life, her pain of losing her children, and her wild roaring twenties exploration of the chaotic new-found freedom for women, was not her contribution in dance. That was a contribution to humanity-to women. Life is short. That film was all Vanessa Redgrave’s interpretation of Isadora’s minute on the planet, wasn’t it? Not really the whole truth or the whole story. It is very hard to get a true picture of someone without the pictures, the memories, the history and even sometimes the future, especially viewing it as though they had not been a part of it. People cannot make true that which they want to believe, and much of history is written of a poison pen. But we do have our imaginations. She was. She was not. How would history have been different without her? Who knows. But dance would have been different. Independent women would not have had the example she made to follow. So, I ordered her biography today and I am going to read it posty hasty. What was said about her after her life, was in some sense, more important to dance-what was discovered, how it is being interpreted, and how her influence has continued and is still visible to today even in the great ballet dancers. Dancers, not aware of her feelings about ballet, owe their thanks to her for being able to dance ballet as well as modern dance and to dance at all openly and freely, in public, half dressed, without fear of reprisal. We owe her our thanks for the blending of ballet and modern dance forms into what is currently expressed as contemporary ballet. We owe her our thanks for the ability to learn both and not be confined to mere interpretations of historical ballets and “acceptable” forms of dancing. Expansion of the kinds of movement acceptable in dance. Costume. Music. Choice. Thinking and decision-making-women choreographers. All of it was done by Isadora first. 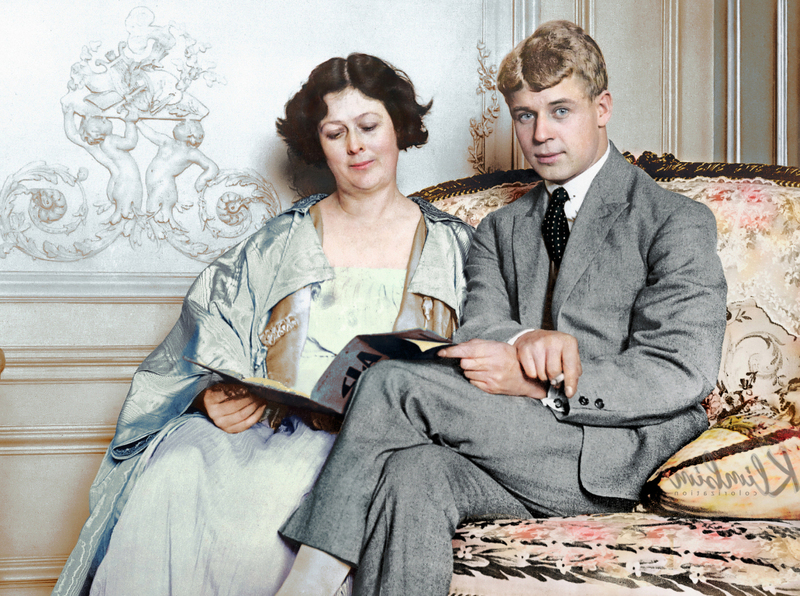 I re-posted the links to several articles about YAGP and one author used Isadora Duncan as a reference to support his view that YAGP was limiting dancers, and another condemned him for that use, and smeared Isadora Duncan as an example of bad living and gross weakness. It is actually pretty funny that people write about things they do not even know about and manage to publish them in major newspapers. What happened to fact checking? Thinking? For without Isadora Duncan, it is likely that dance, all kinds, in America, would have long ago been placed on a back shelf, for classical dance simply would not have adapted to the 21st century as it finally has, despite ballet theorists who, just as guiltily condemn modern dance or any movement not stemming from the practicum of ballet, and it would not have been possible for ballet or the teachings of it, to be a vehicle to communicate new feelings or ideas. Who knows what YAGP’s accomplishments to dance will be in the future, whether great ballerinas or danseur nobles will emerge from it, but it is worth it, to have the opportunity to see all of these dancers and artists emerge on the stage, exciting not to know what to expect, and one positive is that is available for all to see, either online or live for $5 or thereabouts, and to rise to the challenge or form their own opinions about it. George Balanchine, Agnes DeMille and other choreographers would not have seen the need for new balletic choreoghraphy in a world without modern dance and dancers. Martha Graham would have never been. Isadora Duncan is a part of dance history-all of it, whether a few fans of YAGP recognize this or fail to. Whether we want to see artists on the stage who have bullied us into thinking they are the best or not, one cannot deny their determination or energy. Perhaps these dancers will grow into artists knowing now that people care enough to write about, watch them, and become involved in ballet. It is supportive of ballet and dancing. Dance will go on as a medium for expressing feelings, telling stories, old and new, and for freedom by both men and women to move their bodies to whatever music they choose and to live their lives independently. While this is a blog (only) and I primarily use it to vent, I can say with certainty that some people may find inspiration everywhere or somewhere specific, that the rest of us do not agree with, but that inspiration, and that by Isadora Duncan, has been vital to the changes of the the dance. 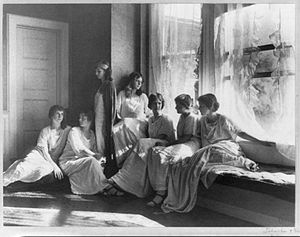 I am pretty sure that the next time I heard about Isadora Duncan was in a beginning level modern dance class in high school/college. We had to read a book called “The Dancer Prepares” by James Penrod (and a few other books), and Isadora Duncan was the first relevant pioneer of modern dance mentioned in the book. Modern dancers did not seek to express their own feelings completely, but often looked to incorporate other steps or views into their dancing. American Indian, various tribal, folk dancing and eastern influences were just a few of the dance forms explored by them. James Penrod, is still on the faculty at UCI, as a revered professor. His book refers to modern dance as “dance developed in the last one hundred years.” I think its history is constantly underway, rolling along, and like a stone has gathered no moss, frankly, ignoring the principles of dance established by great modern dance innovators, so that now the only true form of modern dance accessible to students is in college. So few are its progenitors. But other kinds of freeform dance are popular because of the freedom to explore it underlined. The fact that modern dance did have a technique associated with it seems to have been forgotten by most, and this is clearly evident in the YAGP competition which loosely categorizes all modern dance as “contemporary” because it is a ballet competition. Many of the dancers in it have studied ballet for less than two years and may not win on the basis of their strong ballet technique, but may be recognized as having potential based on their contemporary contribution. So, in its way, it seeks to recognize the best dancers in a free form style as well, or those that show some kind of potential to be professionals. Perhaps the author of that first article was expecting “modern” dance at a ballet competition, but those of us with dancing students know that contemporary ballet is a different animal altogether. 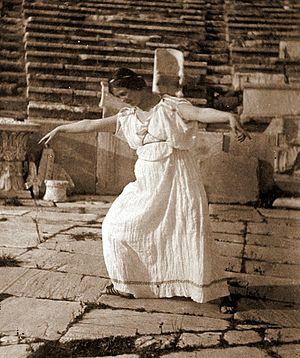 But, Isadora Duncan’s primary contribution was to begin that search with an open exploration of movement, a sort of birth of movement without technique, finding ways in which the body moved beautifully without the dogma of ballet intertwined. YAGP currently does not recognize or seek to inspire other types of dancers, except those with balletic training, but other competitions do. Without naming a technique, many of Isadora’s “natural” steps became the foundation for what is termed as modern dance technique, set by later dancers and choreographers, basically a study of accepted form of natural movement that we repeat every day without even being aware of it, i.e, Twyla Tharp, and specific movement and preparation for doing those movements. So to criticize that foundation is in a sense to criticize nature, human physiognomy, all modern dance forms, and any modern dances/choreography-silly. To condemn YAGP for its presentation of any and all dancers, no matter the winners and no matter the judges, and no matter the rules, is also contrary to supporting dance today. Penrod’s book was published a long time ago and is currently in its 4th edition. It is still widely used, only 104 pp and should be read by dancers. He outlines in one chapter the framers of the idioms of modern dance and explains that its history is rich and varied, and even if only dominating the dance scene for a relatively short period of time, it has outlasted, but is also incorporated into, hip hop, and other forms of dance. He writes,” it broke from the traditions and disciplines of the stiff formality of the ballet of the nineteenth century. At the beginning, modern dance was a way of life, an expression of the freedom of the spirit, unfettered by outdated traditions and worn-out beliefs. Modern dance was in its adolescence at the time of the women’s suffrage movement, Prohibition, World War I, and new movements in art. One such movement was called expressionism (my favorite period-more about that later). Expressionism, which originated in painting, is a subjective expression of the artist’s personal reaction to events or objects through distortion, abstraction, or symbolism. It was a dominating influence on modern dance.” Whether you like it or not, at every YAGP event, you witness Isadora Duncan’s contribution to dance, and most likely, applaud it. Obviously, not all Russians approve of our freedom in dance, our choice, our creativity or various methods of achieving ability, as compared to their own philosophies and education, but apparently enough of them do not feel fulfilled by what is available to them in Russia, to come over here and make their own contributions. I, for one, feel grateful for this, as my daughter’s primary teacher is Russian. While my daughter started late, did not fit squarely into the mold of student dancers in Russia, she loves to dance and works very hard to learn about ballet. Oddly, only her Russian teachers have encouraged her in ballet. They have been supportive, even protective, of her abilities and assets, her health and demeanor. They have not criticized her feet, or her flexibility. They alone, have been willing to take her on, urged her to greater abilities and strength by constant practice and dedication. They have corrected her and rallied her. They alone have said she can dance, have taught her variations and given her parts. And yet, other schools, and teachers, have told her that she was too old to begin dancing, not flexible enough (though they offered no classes to that end), or that she was not good enough to perform with their other dancers. Since this is not Russia and these productions, not the Bolshoi’s, this is ridiculous and exclusive. So important to them are their own self images, what they feel other dance professionals will expect of them, that they lose dancers over time, in favor of dancers who began early enough that they usually have flexibility, or are performance children, ones who have been taught to perform, that they forget that even in Russia, the children start training only at ten, dance in public or for teachers regularly, and that any dancer, willing to learn may become a great dancer. Granted, in Russia, they are all carefully inspected for certain characteristics, and it is evident in watching YouTube videos of them that they all look just alike in early classes, but later, when their body types change, and they grow, they are replaced by dancers more favorable to the future choreographers who will be judging them for performances and roles. They are taught to act as one unit, begin point right away, follow the teachings of Vaganova entirely, by interpretation largely, and yet uniformly for the most part. Theirs is a system. It has even become clear to Russian dancers, who come here, and teachers, that while our children are treated and groomed very differently here, perhaps great things are possible even if these other criteria are not identical to Russian children’s, and that perhaps the baby will not be thrown out with the bath water, as it is sure happened to them in Russia. Perhaps they all end up in the same place with the same training, eventually, or close. The end result in Russian upper classes, however, is very different, with different grown-up bodies, different coloring, style, strengths and features, albeit the training is amazing, only a certain number of those children graduate or are accepted to either the Bolshoi or the Kirov. The rest have to manage on their own to achieve contracts with companies in Russia or elsewhere. How many Russians must feel that to have lost that opportunity to dance in Russia, might have been down to not fitting into the required mold of Russian ballet, not having the right political standing or advantages, so to escape oppression and to pursue what they know and love, they leave Russia and come to our country? Unquestionably, they were not weak, they were not washed-out, they were not allowed to or given the chance to succeed in their own country. They were not accepted. So they came here with their talents. I am honored and welcome them and their gifts, to this country, where I hope they will make great inroads and achievements possible in dance, for our children and for ourselves. I do not think that YAGP is the culmination of those achievements, where more inroads are necessary to revive and encourage dancers of classical ballet and true modern dance. This piece, so far, is an example of expressionism in writing. The title, associates a modern dance term with its opposite of a turned-out position (in ballet) and in which is an automatic contradiction, for of course, in ballet, there is no parallel. Or is there? Also a pun….It is, as well, written from a subjective point of view (my own), and also uses other literary tricks to help my viewers visualize my point of view. It is the subjective expression of my personal reaction to a film and articles about Isadora Duncan, the requirements and exacting atmosphere of ballet, and dance competitions in general. Anything can be expressionism, unless it is something else….If anyone objects to this mode, then they probably would not appreciated Isadora Duncan, YAGP, Russian ballet history and consequence, and yet these authors, actors and filmmakers all used expressionism to communicate their personal opinions or feelings, subjectively. Ironic, isn’t it? Dance is, in the words of someone, I do not remember who, is a form of communication to be used when words alone, music or art (should be included) do not effectively express feelings. Dancers, like other artists seek to express their feelings, not just use their instruments for the repetitive performance of known existing works. Dancers also have other ideas besides dancing. I think the most influential aspect of Isadora Duncan’s movement, in this circle, her contribution, actually, was the lack of one. The antithesis of ballet, yes, but apart from that, something not even akin to ballet, and yet, not impossible for ballet dancers to learn, eventually: to be free to express themselves with that very technique and love of form that was taught, in completely different way! Yes, there are some choreographed dances of Isadora’s extant, but I am not even sure Isadora herself would approve of the repeating of those, for she felt that hers were original interpretations, all, and that other dancers who copied her were not feeling the grass, or the movement of water, or the leaves, but simply copying her-badly. Maybe that is the way Petipa would feel about dancers doing variations in YAGP-that they were not ready, graceful, or accurate and therefore they should go back to the classroom and let the professionals go public with these imitations. Isadora was very precise about how she wanted the dances done at the time and did not improvise on stage. She danced on tours, for hours at a time, and repeated the same choreography each time. She practiced each morning and danced at other times during each day. Her school was acclaimed and some forward-thinking parents sent their children there to learn the new way. Not all of them liked it. Elsa Lanchester, the wife of British film actor, Charles Laughton, was one, who did not care for her remembered experiences there and would probably agree with that writer of the second article, but chiefly she felt that as a child, it was boring, and she from a socialist family, that was more forward thinking. She felt that Isadora relegated her art form to a more aristocratic and noble position than it deserved. Isadora’s curriculum emphasized the free spirit and open interpretation of movement and absolutely no ballet. She used the symphonies of Mozart and Wagner, et al, which was also not the norm. Today, there are many kinds of music which dancers are free to choose from for their pieces. Balanchine would also put a great emphasis on new music created specifically for dance and not ballet classics. This brought in a range of music theretofore unheard of, allowing dancers to have substantial freedom of selection and expression, and movement, even technique. Balanchine closely guarded his choreographed pieces and did not improvise on stage either. Isadora’s life did not mirror her work ethic, where she was zealous and protective of her art. She held her own life out on her sleeve, where all must know it, not unlike actors and actresses or celebrities today, who rue their fame when calamity affects their lives and the world must see their pain, their private business held up for the world to see and judge them by. Once upon a time, privacy was easier to fortify. But what Isadora discovered is that, even isolated, the press is going to write things about you that are not true. You cannot give credence to mere criticism, or let it influence your actions, if you believe in what you are doing. Your art has to retain its position of importance to have any integrity. 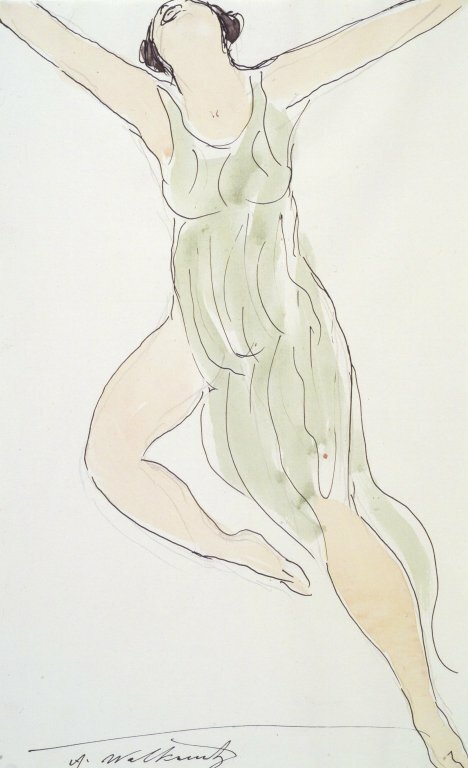 Whatever we have to say about Isadora Duncan, she was devoted to her art. Although Isadora chiefly looked to the Greece, the antiquities, and neo-classicism for her influences, nature, other movement innovators, acceptable because Isadora paved the way for self-expression, looked elsewhere for their unique interpretations of dance. But Isadora was also influenced by the artists and musicians and thinkers of the time, the world at large, progress and even politics and idle thinkers. She was aware of opinion about her, and though she defended herself against it, she continued to believe in her goals. She felt self-doubt, guilt and all of the other feelings that the rest of us would feel, but despite that, she went on, strong in her belief of herself. Isadora was the first really famous choreographer and progenitor of modern dance and her message spread around the world, much as Pavlova was a brilliant publicist, Isadora, in her own way, brought attention to dance and ideas. Therefore, I think it safe to say that dance has a long history of women being able to make statements, find their statements accepted by a wider audience, and therefore we have benefited from this as a population. Without Isadora Duncan, Maria Tallchief might not have been accepted on the stage, or Katherine Denham, or today Misty Copeland. Even Larissa Saveliev and Irina Dvorovenko and Aleksandra Efimova might have to agree that Isadora Duncan paved the way for them to be both talented and smart, finding an opening for an opportunity and exploiting it, and the United States ballet market! Today, many older American ballerinas have finally found their teaching desired, their opinions important and their lives’ histories a learning tool for millions of young dancers. Without their differences in choices, experiences and histories, how would any of these women come into being later in their lives, when it is finally acceptable to have a history, a past, and they may have felt they should not make a contribution, because the world was not open-minded enough to hear their stories, understand their lives, or forgive them their mistakes (if you can call life a mistake), and to learn from their greatness. Perhaps, when she died, Isadora, was not yet finished with what she could have later contributed, perhaps there was more, but she never got to live it, or speak it, or dance it. But her contribution in dance, of the extreme circumstances and experiences life sometimes grants us, to learn from and to grow from, may never impede the great ones from persevering, and this should be a lesson to us all. Take a look at all of the women in dance (just in America for starters) who must be thankful that they are certainly no worse than Isadora for being human, having great spirits and for overcoming overwhelming odds and being successful. Once upon a time, this would not have been possible here, or in Russia, where they the three listed were from. But Gelsey Kirkland, Suzanne Farrell, Cynthia Gregory, Martine Van Hamel and countless others of our own making (mostly) have recently stepped forward in a world only lately accepting of women pedagogues in the highest sense. Not since Isadora, has a woman so confoundedly and openly challenged the pretexts of a male dominated world and field, until now, and singularly gained the influence and prestige that was awarded Isadora. Dance remains a catapult for women to attain strength and demonstrate ingenuity not only in dance, but in business, publicity and marketing-even fashion. Isadora was way ahead of her time. Many other female artists in that middle history have gotten short-shrift for their efforts and progress. Our daughters are lucky to have them as examples of strong women, and so are our sons! Pavlova would have been proud of them, Isadora would have cheered them. I salute them, as strong, intelligent women, like Pavlova and Isadora. Both were important to ballet and the world as we know it. All these histories are apparent today and Isadora’s influence made possible the freedom in dance by which, even competitions such as YAGP, would not be possible without. So, ironically, there does seem to be a parallel position.